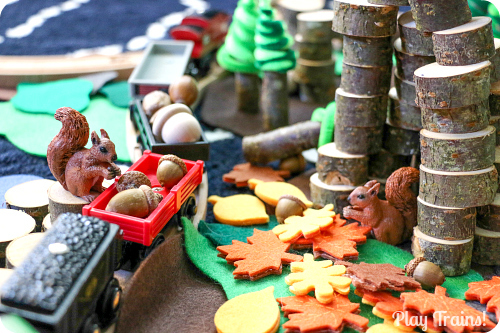 Our third Fall Invitation to Play in the series is a squirrel train small world sure to delight any child who loves both woodland animals and trains! 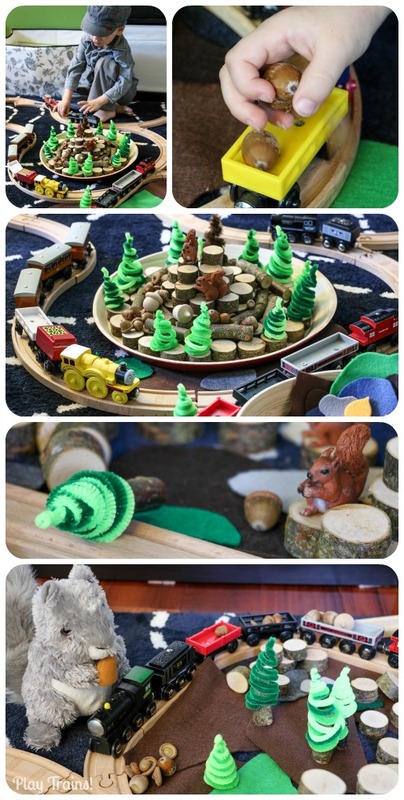 The Little Engineer was so excited to play Squirrel Train, and it turned into a creative, relaxing play experience for both of us. 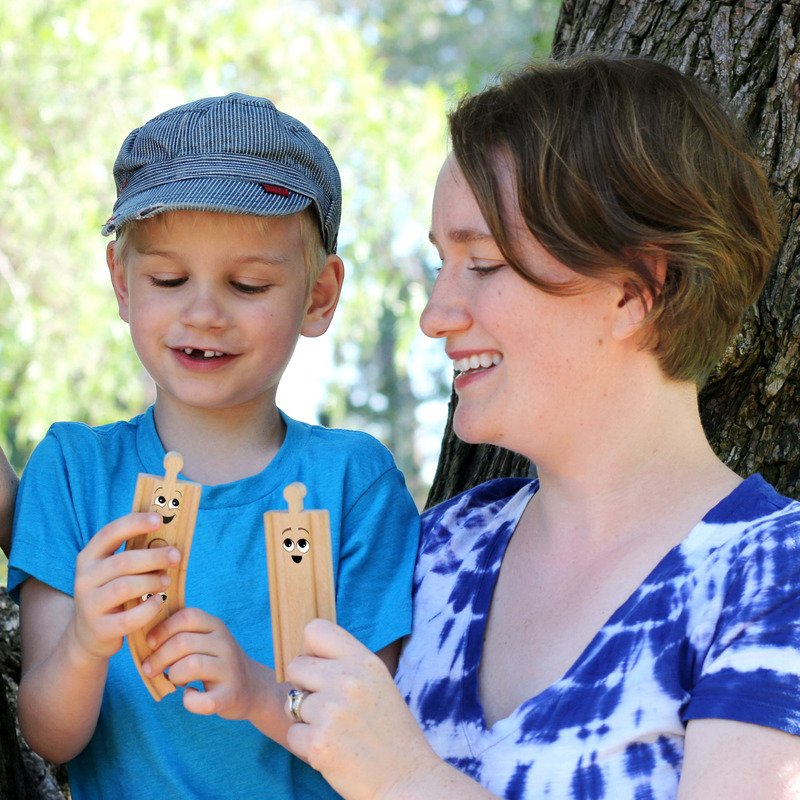 Make sure to follow the links to My Nearest and Dearest, Twodaloo, Fantastic Fun and Learning, and Buggy and Buddy at the end of the post to see the play invitations they’re sharing today. 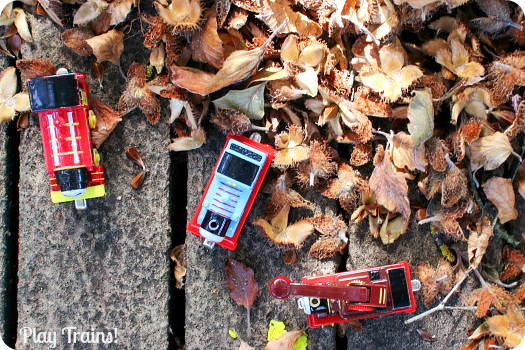 I’ve been really enjoying all of their creative fall play ideas this week! 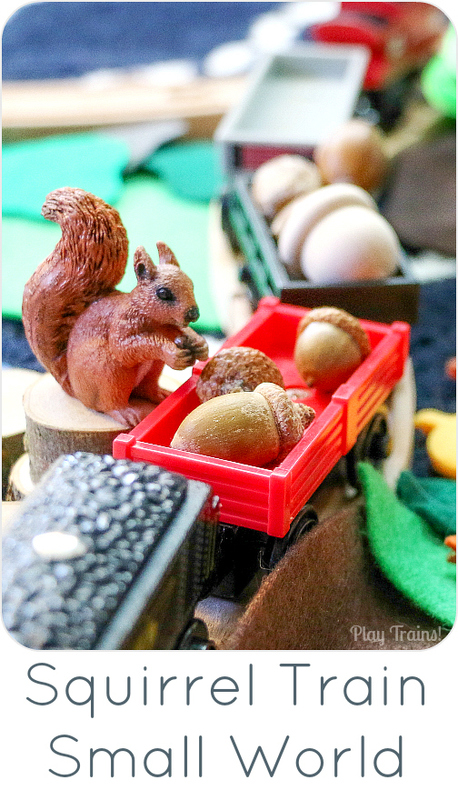 Trains plus cute, furry animals — just saying the words “squirrel train” put a huge smile on the Little Engineer’s face! 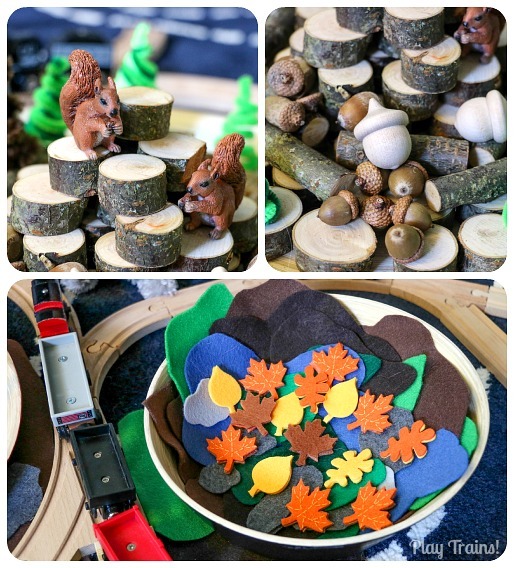 This small world combines natural items with classic craft materials to build a woodland world around the train tracks. 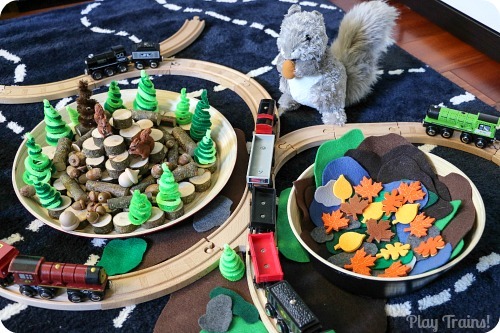 And, of course, it couldn’t be Squirrel Train without acorns! 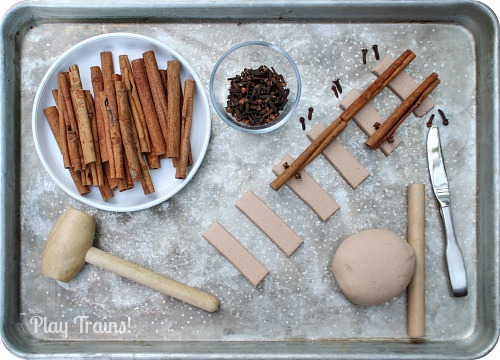 Arrange the world-building materials in an appealing manner. 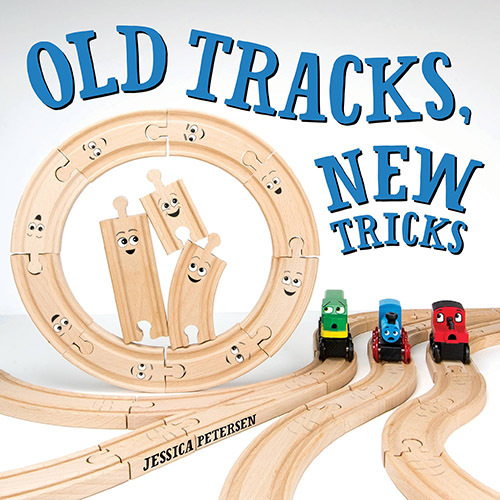 Build just enough train tracks to get your child started, and place a few pieces of felt and a tree or two next to them, to suggest how they might be used. 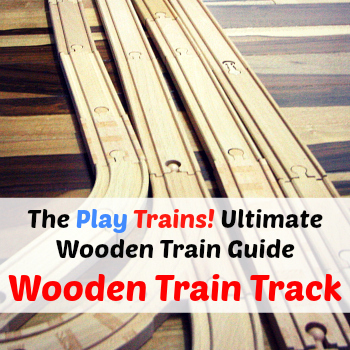 Put the trains on the tracks, with as many freight cars as you can muster up. 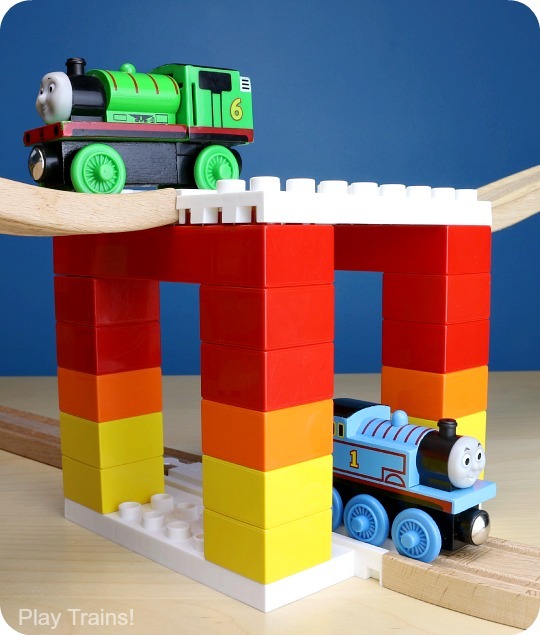 First, the Little Engineer built the world around his train tracks, putting the felt in place on the carpet. Then he picked up a tree and one of the mini logs. “I can fit this in here,” he announced, and suddenly our pipe cleaner trees had trunks! 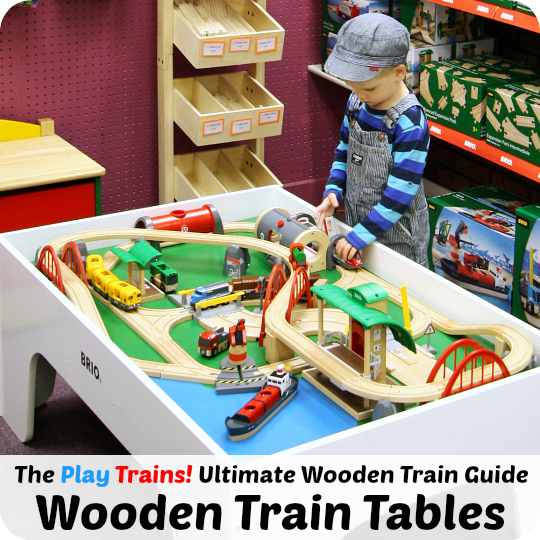 As he moved on into train play, he named this place “Squirrel Town.” “There are fifty towns!” he told me, but the only other one I heard about was “Acorn Town.” The acorns were loaded and unloaded a few times before he went and found our wooden Mr. Jolly’s Chocolate Factory, placing it beside the tracks and declaring it an “acorn factory”. This is a really charming way to spend an afternoon. 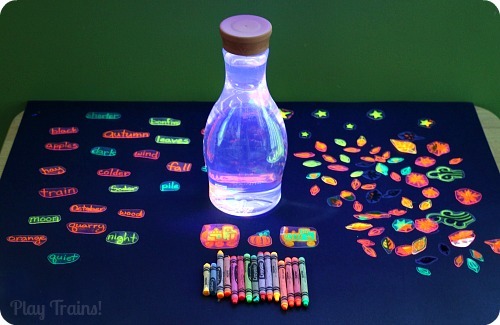 Plus, the materials promote sensory exploration of different textures. 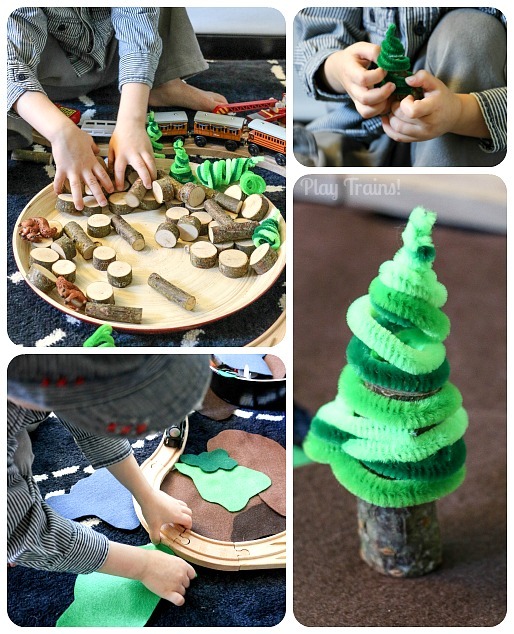 The log slices add an element of building, and the acorns bring in fine motor skill practice. With the trees and stacks of branch slices falling over and the acorns falling out of the freight cars, it’s great practice being careful with one’s movements. 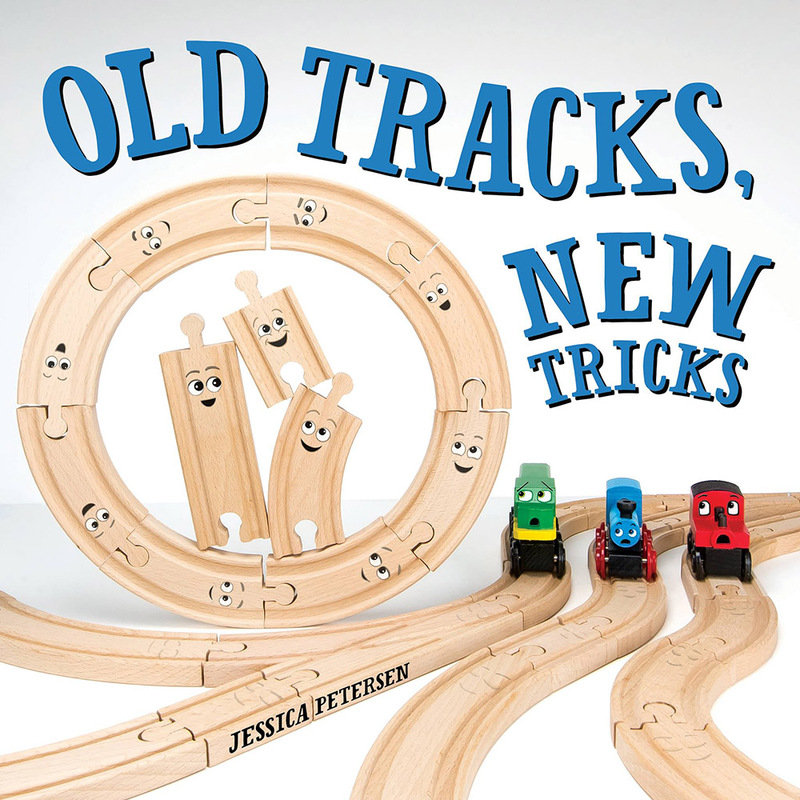 If your child has fun with this one and wants to try more creative activities with their wooden trains, Old Tracks, New Tricks — my wooden train picture book — has more than twenty creative activities to try, plus a guide to inventing your own track tricks at home. 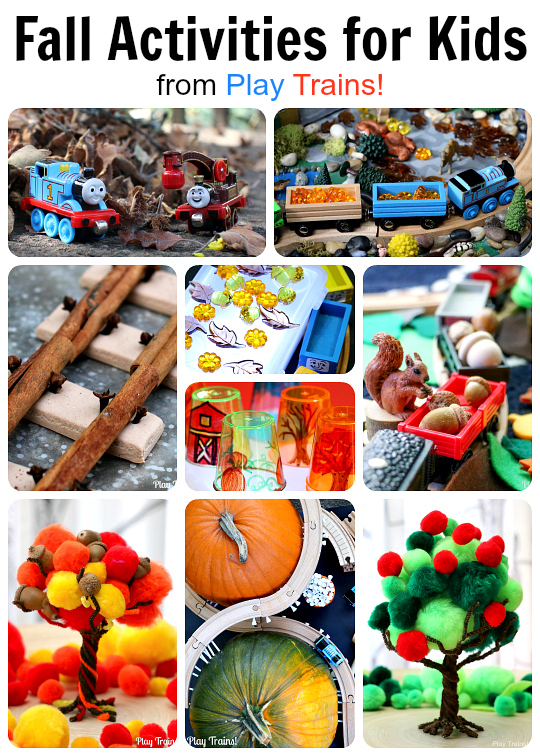 Head on over to visit the other blogs participating in the Fall Invitations to Play series for more exciting ideas for fall fun! 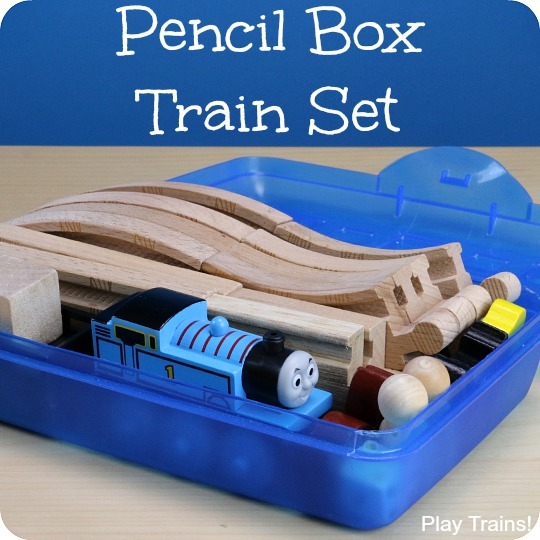 What train cards are you using? Thanks. Jessica, I am always amazed by the level of detail in your small worlds. 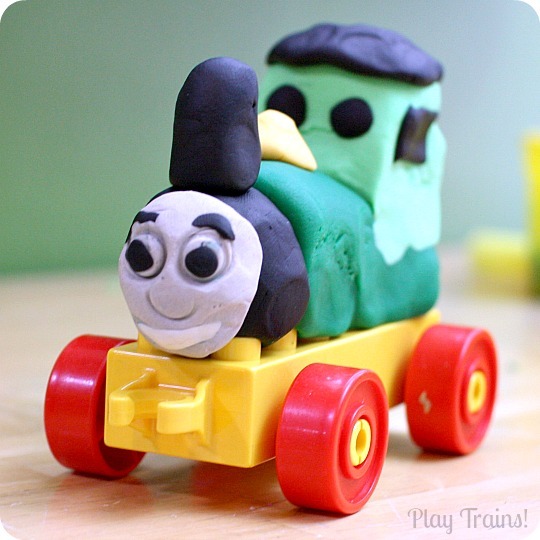 They are all so creative and this one is no exception. 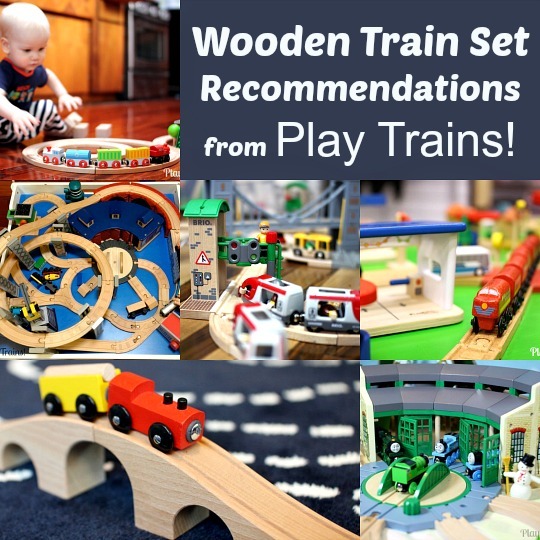 What a fun set up for you and your son. Great job!! I absolutely love those little trees! 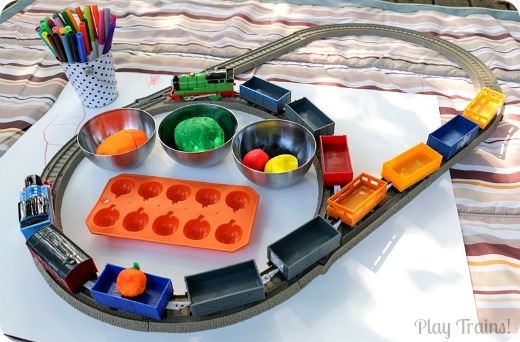 Such a creative idea. Another great one, and gorgeous photos! I’ll be featuring this post on The Sunday Showcase as well. Thanks for linking up all your awesome ideas!